With 46 Scottish Championships and 36 Scottish Cups in their trophy cabinet, it's fair to say that Celtic FC is a club synonymous with Scottish football. Along with their domestic successes, they were the first British club to win the European Cup, having done so in 1967. Their Old Firm derby with Rangers is one of the most popular rivalries in the football world, and the two clubs have a long history of competing against each other. 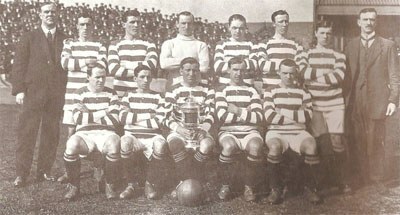 Celtic FC team in 1914. With a foundation date of 1887, Celtic was formed as a means of fundraising for the "Poor Children's Dinner Table" charity. A year later, the club played its first official match against Rangers, thus setting the stage for a rivalry based as much on the clubs' political and religious differences than on their on-field disputes. For the first couple of decades, Celtic was slightly more successful of the two clubs, winning 17 Scottish Championships and 12 Scottish Cups until 1927. 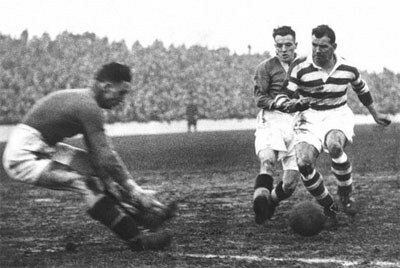 Even with Jimmy McGrory – one of the most prolific British strikers of all time – as a focal point of their attack, Celtic slowly found itself on the back foot in a battle with Rangers. The next four decades saw Celtic win the Scottish Championship a mere three times, a far cry from the dominance they exerted early on in the century. They also managed to win five Scottish Cups during this time, but it was a small consolation for the disheartened fans. The Celtic player Jimmy McGrory with the ball. With Jock Stein taking over as manager in 1965, things immediately took a turn for the better. With his undeniable charisma and influence, Stein transformed Celtic's under-performing team into a machine that claimed nine consecutive Scottish Championships from 1966 to 1974. The 1967 season was particularly memorable, with Celtic winning every single competition they played in, including being the first non-Latin side to win the European Cup. Stein left the club in 1978, having won 10 Scottish Championships, 8 Scottish Cups and a European Cup. The following period saw Celtic enjoy further domestic success, including five additional Scottish Championships and four Scottish Cups before the end of the 80s. But the early 90s turned out to be a time of decline, with the club's numerous financial difficulties having them come precariously close to bankruptcy. They were eventually saved by businessman Fergus McCann, who took over the club and placed it on the stock market. This turn of events led to Celtic getting back on the road to recovery, winning a Scottish Cup in 1995 and a Scottish Championship in 1998. In 2000, Martin O'Neill took over as manager and led the club to a Double in his first season in charge. This would soon prove to be another turning point in the club's history, as Celtic went on to claim ten Scottish Championships and six Scottish Cups in the years that followed, once again replacing Rangers as the most dominant club in the country. The club adopted a logo in the 1930s with a green four leaf clover as the dominant symbol. The leaf is outlined by a circle with the text “The Celtic Football Club” and the year of inauguration. 1887 The club is established. 1892 The club move to the new Celtic Park. 1892 Winning their first Scottish Cup title. 1893 First time winner of the Scottish League Championship. 1907 Winning their first Double (Scottish Cup and League). 1922 Jimmy McGrory is signed to the team. 1931 The first non-Brittish player is signed (Joe Kennaway, Canada). 1957 Winning their first Scottish League Cup title. 1965 The former Celtic player Jock Stein is hired as manager. 1967 First European Cup title. 1967 Winning their first Treble (Scottish Cup, League Cup and League). 1994 The businessman Fergus McCann become the new club owner.